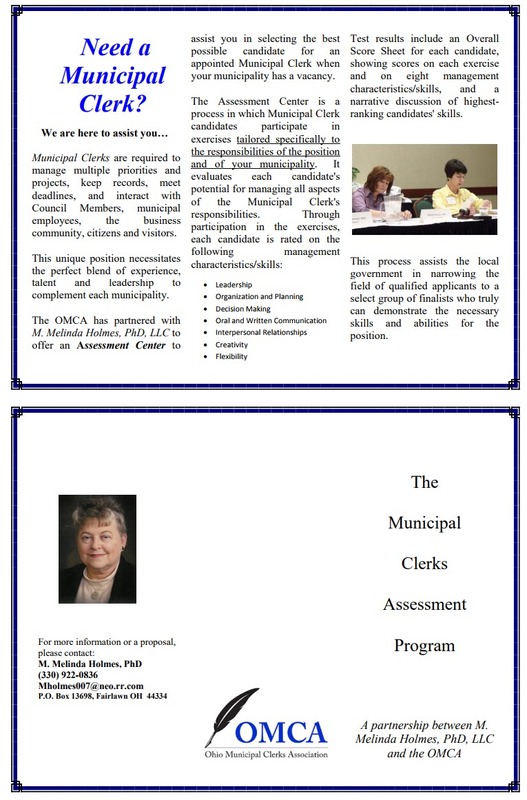 We are proud to announce a partnership with the Ohio Municipal Clerks Association (OMCA) to offer the ASSESSMENT CENTER as part of the selection process for an appointed Municipal Clerk. This effort results from an identified need: Last year, the OMCA was contacted by an Ohio city official when the City Clerk retired after many years of service. The official asked if OMCA could assist in any way with their hiring of a new Municipal Clerk. That question resulted in a partnership agreement between our company and the OMCA. Details are included in the accompanying brochure. Any questions for OMCA concerning the partnership may be directed to Tami Kelly, MMC, at (614)277-3065; or email at tkelly@grovecityohio.gov.